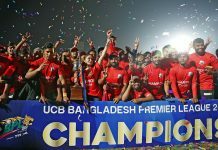 The 5th edition of AKS Bangladesh Premier League (BPL) T20 Powered by Shah Cement starting today at Dhaka after the Sylhet part was successfully ended on November 8. 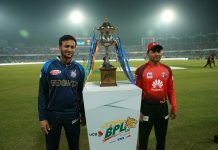 In the first match of the day, Rangpur Riders will face Rajshahi Kings at Sher-e-Bangla National Cricket Stadium (SBNCS). Rangpur previously beat Rajshahi in the second match of the tournament at Sylhet. 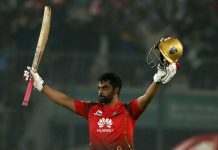 But lost their second match against Chittagong Vikings. Rajshahi Kings had a poor spell at Sylhet as they have lost both of their matches against Rangpur Riders and Sylhet Sixers. So both Rangpur and Rajshahi will be looking for a good start at Dhaka. Second match of the day will feature top two teams from the points table. Sylhet Sixers are currently top of the table with 6 points from 4 matches while Dhaka Dynamites are second in the table with 2 points from 2 matches thanks to their better net run-rate. Sylhet have won the first match between the two teams last meeting at Sylhet by 9 wickets in the opening match of the tournament at Sylhet. Dhaka Dynamites bounce back from the defeat in their next match and seal a comfortable win against Khulna Titans.